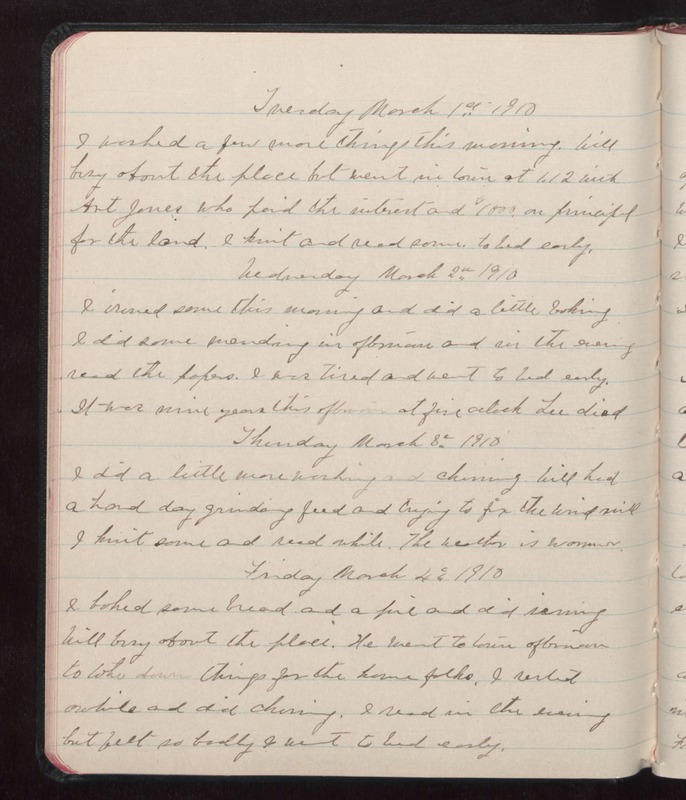 Tuesday March 1st 1910 I washed a few more things this morning. Will busy about the place but went in town at 1.12 with Art Jones who paid the interest and $1000 on principal for the land. I knit and read some. to bed early. Wednesday March 2nd 1910 I ironed some this morning and did a little baking I did some mending in afternoon and in the evening read the papers. I was tired and went to bed early. It was nine years this afternoon at five oclock Lee died Thursday March 8 1910 I did a little more washing and churning Will had a hard day grinding feed and trying to fix the wind mill I knit some and read awhile. The weather is warmer. Friday March 4 1910 I baked some bread and a pie and did ironing Will busy about the place. He went to town afternoon to take down things for the home folks. I rested awhile and did churning. I read in the evening but felt so badly and went to bed early.